This was definitely one of the strangest books I read in 2017. I think it might fall into the admired but unloved category. 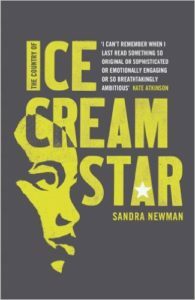 Sandra Newman clearly put a lot of work into creating this novel, it just didn’t quite resonate with me. That doesn’t mean it didn’t impact me though. I thought about this book for weeks afterwards, trying to puzzle out how I felt about it. The story takes place in some future where most of the population of America has died off and society has collapsed. There’s some disease that makes people die in their late teens or early twenties. There’s no escaping Posies (their name for the disease). Children have organized themselves into clans run by the eldest kids. Where this book shines is in the world building. Can you imagine a world run by teenagers? Newman clearly thought through the ramifications and built her world to reflect that. It’s a world where children grow up quickly, language changes happen within a generation or two, and emotions run high. Ice Cream Star is about 15 years old when her brother gets Posies. Her clan has just captured a white man who claims to be 30 years old. Driven by the promise of a cure, Ice Cream forges a bond with this man that takes her in some unforeseen directions. Newman’s novel is large in scope, a true epic story. My major complaint is that after 640 pages, there was no real resolution to the story. In my opinion, it’s okay to have sequels, but your individual books need at least some kind of resolution to make the reader happy. This didn’t have that. Newman chose to tell her story in dialect which took a few chapters to get into. I could see it being off putting to some readers though. I’m not sure if I’ll read the sequel when it comes out to be perfectly honest. Although the worldbuilding was great, I didn’t really connect to the characters. I’m not sure what the point of revisiting them would be. Share the post "On the bright side, no old people means they don’t have to read think pieces in The Atlantic about their generation ruining the world"